1-, 3- , and 6-month reports. Google search: CRS Haiti evaluation. The most detailed information we've found about CRS programs is contained in its reports on specific activities (we found about 6-12 for each of the 7 program areas.) Some of these reports provide information an particular programs, while others are on the general type of programs being administered (guidelines, etc), not on activities in specific parts of the world.14 We have found no way to determine which (and how many of) these programs are taking place in each place. Chronicle of Philanthropy. 6 Months After Earthquake, Haiti Struggles to Rebuild. http://philanthropy.com/article/Charities-Struggle-to-Help/66199/ (accessed November 30, 2010). Archived by WebCite® at http://www.webcitation.org/5udhx84oU. CRS. About Us: Financial Information. http://crs.org/about/finance/ (accessed December 1, 2010). Archived by WebCite® at http://www.webcitation.org/5vf4UC2u3. CRS. Blog. http://crs-blog.org/ (accessed December 3, 2010). Archived by WebCite® at http://www.webcitation.org/5uhdk1I1L. CRS. 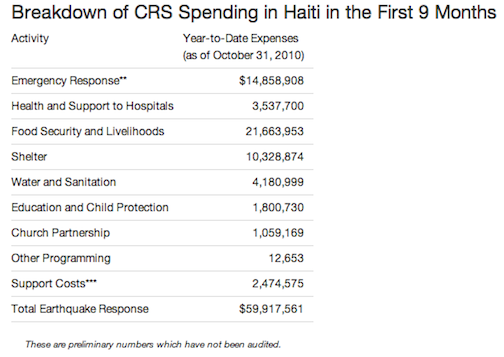 Breakdown of CRS spending in Haiti in the first 9 months. http://crs.org/emergency/haiti/financials.cfm (accessed January 11, 2011). Archived by WebCite® at http://www.webcitation.org/5vfSbupmq. CRS. Five Years After the Tsunami, Rebuilding Complete. http://crs-blog.org/five-years-after-tsunami/ (accessed November 30, 2010). Archived by WebCite® at http://www.webcitation.org/5udjZKY3i. CRS. Haiti Earthquake: 6 Months Later. http://crs.org/haiti/haiti-earthquake-6-months-later/ (accessed November 30, 2010). Archived by WebCite® at http://www.webcitation.org/5udfDln0G. CRS. Haiti Month One: Food for a Half a Million. http://crs.org/haiti/one-month-post-quake/ (accessed November 30, 2010). Archived by WebCite® at http://www.webcitation.org/5udfASGjh. CRS. Haiti Quake Response: Financial Information. http://crs.org/emergency/haiti/index.cfm (accessed November 30, 2010). Archived by WebCite® at http://www.webcitation.org/5udgj5nED. CRS. Health for Women, Children, Community. http://crs.org/indonesia/mother-child-hospital/ (accessed November 30, 2010). Archived by WebCite® at http://www.webcitation.org/5uhdR8L06. CRS. Home page. http://www.crs.org/ (accessed January 11, 2011). Archived by WebCite® at http://www.webcitation.org/5vf1yrd1J. CRS. How We Serve. http://www.crs.org/how/ (accessed December 3, 2010). Archived by WebCite® at http://www.webcitation.org/5uhaitiCo. CRS. Letter from Haiti. http://crs.org/haiti/letter-from-field/ (accessed November 30, 2010). Archived by WebCite® at http://www.webcitation.org/5udfegVaV. CRS. Publications catalog: Agriculture and environment. http://www.crsprogramquality.org/category/agriculture-and-environment/ (accessed January 7, 2011). Archived by WebCite® at http://www.webcitation.org/5vYjFObsW. CRS. Publications catalog: Best/Promising Practices. http://www.crsprogramquality.org/category/bestpractices/page/2/?s (accessed December 3, 2010). Archived by WebCite® at http://www.webcitation.org/5uexNZEWE. CRS. Publications catalog: Education. http://www.crsprogramquality.org/category/education/ (accessed January 7, 2011). Archived by WebCite® at http://www.webcitation.org/5vYjJ6faO. CRS. Publications catalog: Health. http://www.crsprogramquality.org/category/health/ (accessed January 7, 2011). Archived by WebCite® at http://www.webcitation.org/5vYjN1pm3. CRS. Publications catalog: HIV and AIDS. http://www.crsprogramquality.org/?cat=18 (accessed January 7, 2011). Archived by WebCite® at http://www.webcitation.org/5vYjPcoxO. CRS. Publications catalog: Microfinance. http://www.crsprogramquality.org/?cat=14 (accessed January 7, 2011). Archived by WebCite® at http://www.webcitation.org/5vYjVI0AA. CRS. Publications catalog: Peacebuilding. http://www.crsprogramquality.org/category/peacebuilding/ (accessed January 7, 2011). Archived by WebCite® at http://www.webcitation.org/5vYjZCZ9D. CRS. Publications catalog: Water and sanitation. http://www.crsprogramquality.org/category/water-and-sanitation/ (accessed January 7, 2011). Archived by WebCite® at http://www.webcitation.org/5vYjbyhuY. CRS. CRS Program Quality. http://www.crsprogramquality.org/ (accessed January 7, 2011). Archived by WebCite® at http://www.webcitation.org/5vf4ze3j8. CRS. Publications catalog: Monitoring and Evaluation. http://www.crsprogramquality.org/category/mande/ (accessed December 3, 2010). Archived by WebCite® at http://www.webcitation.org/5vf57qw1o. CRS. Taking the Long View for Haiti. http://crs.org/haiti/recovery-transition/ (accessed November 30, 2010). Archived by WebCite® at http://www.webcitation.org/5udeq6yJ4. CRS. The Indian Ocean Tsunami, Five Years Later. http://www.crs.org/emergency/tsunami/index.cfm (accessed December 1, 2010). Archived by WebCite® at http://www.webcitation.org/5uhdLoF0s. CRS. Three-Month Haiti Quake Anniversary Nears. http://crs.org/haiti/3-months-post-quake/ (accessed November 30, 2010). Archived by WebCite® at http://www.webcitation.org/5vf5F6jsc. CRS. Tsunami Relief Financial Summary (PDF). CRS. Haiti Quake Response. http://crs.org/emergency/haiti/index.cfm (accessed December 3, 2010). Archived by WebCite® at http://www.webcitation.org/5uhdY22j9. CRS. Where We Serve. http://crs.org/where/ (accessed December 3, 2010). Archived by WebCite® at http://www.webcitation.org/5uhYn4TZR. USA Today. Much of aid for Haiti is still unspent. http://www.usatoday.com/yourlife/mind-soul/doing-good/2010-11-29-sharing... (accessed December 3, 2010). Archived by WebCite® at http://www.webcitation.org/5uezYcCpd. Year-to-Date Expenses (as of October 31, 2010)...Total Earthquake Response: &dollar;59,917,561." CRS, "Breakdown of CRS Spending in Haiti in the First 9 Months." CRS, "Breakdown of CRS spending in Haiti in the first 9 months." Distributed food to nearly 900,000 people. Currently providing food to more than 90,000 students in over 270 schools, and monthly food rations to more than 100 orphanages and child-care centers in Port-au-Prince and Les Cayes, benefiting nearly 10,000 children. Provided emergency shelter materials to more than 114,000 people. CRS health care team performed over 960 emergency operations and conducted 62,000 outpatient consultations. Supported hundreds of thousands of people with food, water, sanitation, shelter materials and protection, including at two of the largest camps for the displaced. Established five "child-friendly spaces" for unaccompanied children at camps, regularly attended by more than 1,500 children. 375,000 gallons of water per month. 164 Church partners. While the government of Haiti must play a leadership role in the recovery of Haiti, the success of the process will depend in large part on the actions of a robust civil society that defends, promotes and responds to the interests and needs of poor and marginalized Haitians. The Catholic Church of Haiti continues to be one of Haiti's most influential civil society actors and is a provider of many basic social services." 11. CRS, “Annual Report 2009,” Pg 35. CRS, "Annual Report 2009," Pg 9. In fiscal year 2009, CRS responded to many emergencies: drought in Kenya, flooding in Burkina Faso and a string of disasters in Asia and the Pacific region. But responding to disasters is just part of the picture. Our mission includes helping communities develop emergency plans to help lessen the devastation caused by natural and man-made disasters. Our HIV and AIDS programs directly served more than 8 million people this year. Through the President's Emergency Plan for AIDS Relief (PEPFAR), CRS provides a wide spectrum of care, including antiretroviral treatment, in 10 countries. AIDSRelief has helped more than 450,000 people with HIV, including 175,000 who received antiretroviral treatment last year. CRS also brought help to more than 650,000 children orphaned or made vulnerable by HIV. CRS is mounting other health initiatives, including distributing 2.8 million insecticide-treated mosquito nets that will help stop the spread of malaria in Niger, thanks to a grant from the Global Fund to Fight AIDS, Tuberculosis and Malaria. For most of us, access to water means turning on a faucet. Yet 400 million children in the world have no access to safe water and 2.6 billion people lack basic sanitation. In 2009, CRS water projects helped some of the 30 million people across the Horn of Africa affected by drought and brought water purification tools to cholera-ravaged areas of Zimbabwe and irrigation systems to rice growers in Madagascar. Too many families can't send their children to school—because they can't afford to or because there isn't one. CRS is working in communities in Pakistan, Guyana, Vietnam and Rwanda to give children, youth and adults a bridge to a better future. Many roads lead to peace, but in much of the world there are also many detours. In 2009, CRS continued to serve people affected by ongoing violence in Sudan, Zimbabwe, Democratic Republic of the Congo, Sri Lanka, Pakistan, Afghanistan and the Middle East. We also provided job training to help women steer clear of human trafficking. This year saw the completion of our five-year Indian Ocean tsunami rebuilding and recovery effort. Thanks to the overwhelming generosity of the American people, CRS has renovated or built more than 13,000 permanent homes in India, Indonesia and Sri Lanka. In Aceh province, Indonesia, we worked on more than 300 community infrastructure projects, including construction of a Mother and Child Hospital in Banda Aceh, the first of its kind in the region. Catholics across the United States continue to embrace Operation Rice Bowl each year as part of their Lenten practice of fasting, praying and almsgiving. In 34 years, a total of &dollar;167 million has been collected to help those in need, both overseas and in U.S. dioceses."